Our favourite local trails are in the Colquhoun Mountain Bike Park, where we operate the majority of our mountain bike tours. Suitable for riders with a fitness level 3-5 and skills of C-E. Allow 2.5 hours including travel to and from Lakes Entrance. * Discount $10 pp if BYO Bike. Just want to hire a bike for some waterfront cycle paths? Lakes Entrance boasts a good 2hrs worth of mostly flat paths that take in amazing lake scenery. See Hire Rates here. 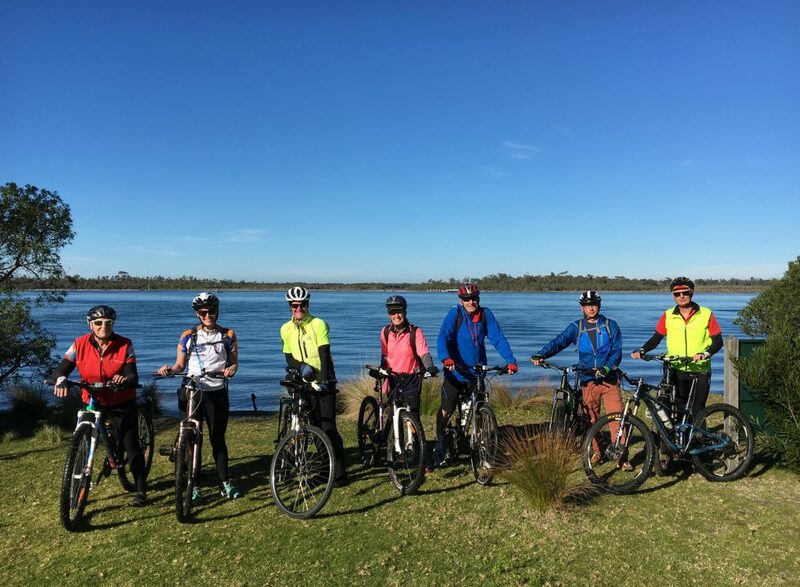 For Self-guided bike journeys, keep reading – You’ve got options to ride approx 20km including waterfront scenery to Metung or Lake Tyers or 40km into forest and farmland to Bruthen or Nowa Nowa. Not sure what riding adventure to book? Take our riding quiz here. Your self-guided forest trail ride will take you onto the Gippsland Lakes Discovery Track, which follows and criss-crosses the Mississippi Creek, surrounded by ferns and old growth. Stop in at The Quarry for a break, at the mine site of the original rocks holding open the Entrance of the Gippsland Lakes. The track is a mainly shaded, compact gravel track, with just a few short hills in the last few kilometres before the Rail Trail. At the Rail Trail, turn left for a 12km roll into the township of Bruthen, a beautiful village set in a scenic valley, that boasts the Bruthen Brewery, the Bruthen Bizarre & the Tambo River! A long gentle and mainly downhill ride, on double track that allows you to ride side by side with your friends. 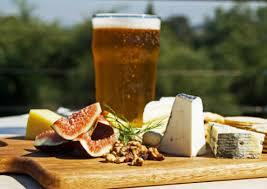 A popular Ride & Dine package here – you’ll have the opportunity to sample the beers at the Bruthen Brewery. Sample a selection of the local brews with the Tasting Paddle, and after you’ve found your beer of choice, your Ride & Dine package includes a meal & your favourite beer. Includes 5hr self-guided bike hire & shuttle pick up from Bruthen. Includes 5hr self-guided bike hire, lunch & drink per person at Bullant Brewery, shuttle return to Lakes Entrance. If 20km is more your distance of choice & sealed roads more your scene, then ride to beautiful Metung. You might as well swing past Kalimna Jetty on your way out of town, after all, it’s the best waterfront riding you can get. From there, ride the shoulder of the Princes Hwy for a few kilometres and turn left onto Kalimna West Rd. This takes you down to historic Nyerimilang, a beautiful old property with a magnificent clifftop view over the Gippsland Lakes. Take a moment. Take a selfie. Back on the bike, cruising through undulating farmland and pondering your retirement plan. Pause at Nungurner Jetty Rd – Optional extra 4.5km loop ride down to picturesque Nungurner Jetty, past local art studios & galleries. Continue on Nungurner Rd, turning left down Rosherville, past Chinamans Creek. Dream about those yachting adventures to be had as you roll past the boats and arrive in Metung in time for a delicious lunch at Bancroft Bites. Your package includes a well earned lunch & tea or coffee. Take the time to appreciate this quiet waterfront village. 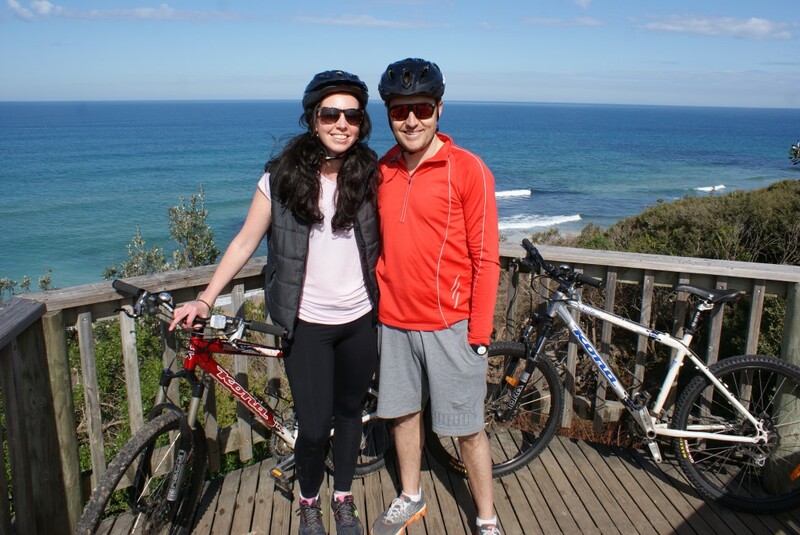 Includes 4hr self-guided bike hire, shuttle return to Lakes Entrance. 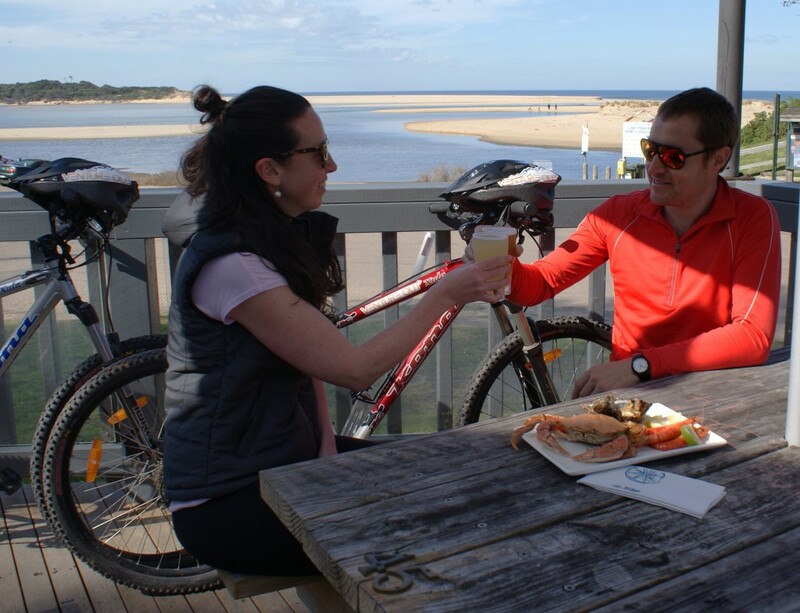 Includes 4hr self-guided bike hire, lunch & drink per person at Bancroft Bites, shuttle return to Lakes Entrance. Fancy riding from Lake to Lake? This ride is just under 20km but does include steep hills (which are totally rewarded btw). Break yourself in slowly and cruise around the waterfront cycle path, you’ll notice the black swans and pelicans on the Cunningham Arm. Turn right at the United Service Station and follow a winding waterfront trail up to Eastern Beach. Zig zag your way onto Golf Links Rd, a quiet residential street that leads to Lake Bunga Track. Look for the little right turn marked ‘Nature Track’, which leads you to Lake Bunga beach. This track is prettier & windier than if you miss it but all tracks lead there anyway. Take some time to appreciate the beach. Go for a little walk or dip your toes in the lake or ocean waves. Back on the bike, it’s a challenging uphill on Lake Bunga Beach Rd, rewarded halfway up with an awesome ocean view. Catch your breath. Tired selfie with an epic view. You just rode the steepest bit. Continue on an easier uphill until you hit the Princes Hwy. Look to your right and see a dirt road? Take that road, its downhill!!! This leads you to the first Oil Bore in Australia. What goes down has to get back up again right? Cross the creek and spin those pedals back up the next hill, and we promise that is the last of the tough uphills. Your dirt road meets the bitumen at a Fire Shed, and you’re now at Toorloo Arm. You’ll see a bike path across the road from here, ride that until you see Cliff Rd on your right and turn down it for a few hundred metres. Turn left onto a wide unmarked forest track. This winds through coastal bush to Red Bluff Rd. Turn right on it and you’re at Red Bluff Lookout. You’re at the local surfing spot, and this view is worth every kilometre. If you’ve got the time, lock the bikes and head down to the beach for another swim. You’re beach hopping on 90 mile beach! As you leave Red Bluff Lookout there is a track on your right heading into the trees. Follow it. It feels like you’re riding through a tunnel of trees with glimpses of ocean and sky through the gaps. Its mostly flat and fun with a little bit of boardwalk in it. Once you pop out at Beacons Hill, it’s a down hill ride on bike path beside the road to Lake Tyers Beach, and you’ve found yourself at another beach! Pop into Lake Tyers General Store and ask to see Scott Kingmans photography in the gallery downstairs. What an epic little lake to lake adventure! 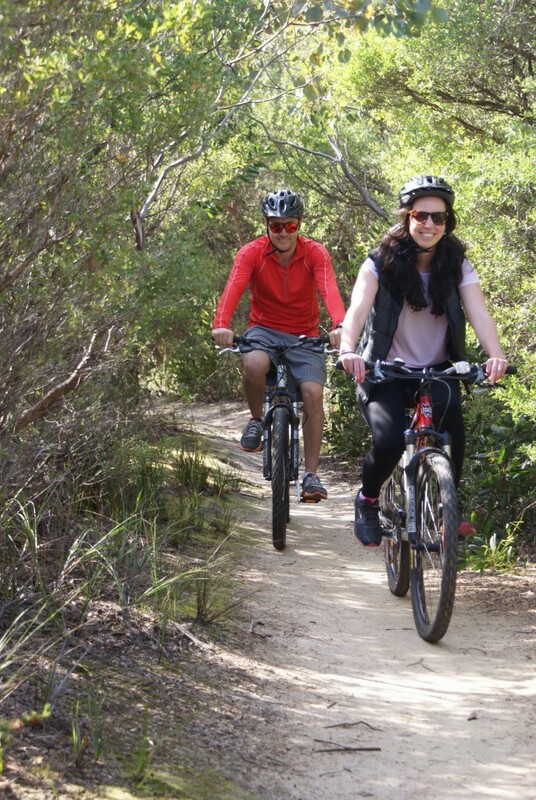 Includes 4hr self-guided bike hire & return shuttle to Lakes Entrance. Includes 4hr self-guided bike hire, a wood fired pizza & drink at the Waterwheel Tavern, affectionately known by the locals as the ‘Tav’, return shuttle to Lakes Entrance. Includes 5hr self-guided bike hire and a shuttle return to Lakes Entrance. Includes 5hr self-guided bike hire, a burger & drink of choice from Mingling Waters cafe and shuttle return to Lakes Entrance.